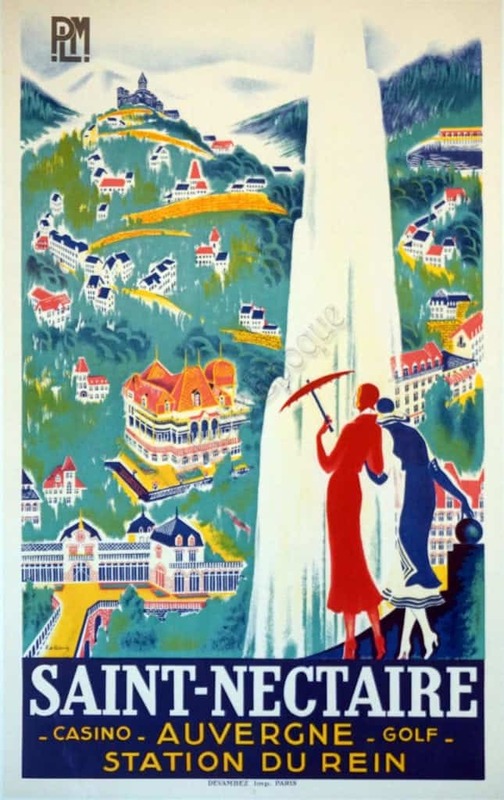 Travel Poster for PLM (Paris Lyon Mediterranee) advertising Golf, Casino and sightseeing to Saint-Nectaire in the Auvergne region. Pictured is a gorgeous hillside with many beautiful Art Nouveau styled homes. The area pictured is known for their spa & hot spring. As you can also see, 2 women (one in red and one in blue) watching the waters fall from a perfectly placed ledge across from the Alps. Saint-Nectaire used to be an estate in Auvergne that was owned by a Count. Now, it’s become a popular retreat spot.